Now we have the new mLAs and with them, a new official mid-size Backhoe (8069) from TLG. But lets not forget, that TLG also made one a few years ago (8455). Before the PF and the LAs era, but probably one of the best Technic flagships ever! Ya, ya... it had pneumatic cylinders. Lots of them! 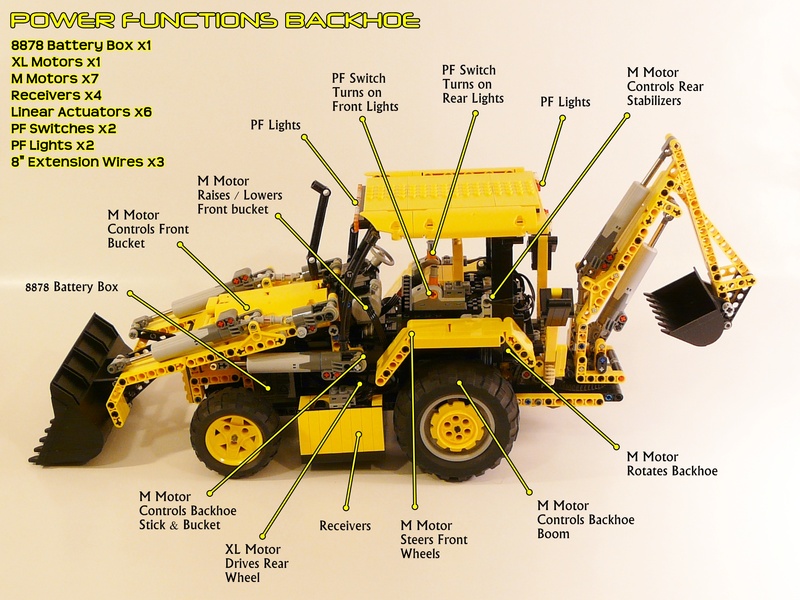 But in the meantime lets see this amazing Backhoe, built by Coney (or Contech7). It is impressive the number of remote controlled functions, that Coney managed to include within this Backhoe. Not less impressive, is the list of PF elements used to implement all these functions. You may find extra photos from this model at Coney's Brickshelf folder, where you can learn a lot more about the solutions he used to put all the required PF parts and mechanisms, inside this model limited space, without sacrificing the realistic outlook. But unfortunately again: Video is locked by YT because of "Sony Music Entertainment Content" here in Germany. Can't understand why YT doesn't stream the video without audio, in these cases, for the restricted countries. It would a matter of just popping an appropriate message. Also more clear messages to the uploaders would be helpful. I've just found where YT provides information about user "Content ID Matches" and the consequences for each video. For instance in my case, I've two matches, and only one has restrictions in one country (Germany). So from YT side the information is clearly provided. Apart from the fact that our chancellor seems not to be able to see things in a more european way we even have have a strong content mafia in our land. Please tell me if there are some problems with this. I saw this creation a while ago and I am still amazed!! It is incredible! I doesn't even look like you could fit 7 M motors in there in the first place! Regarding the YT videos. How were you able to see which countries were blocked? I posted a video and it said the song was matched content so I stopped putting songs on my videos since.. just to make sure everybody could watch them..
From YT, at My Videos you'll find 'Content ID Matches' from the left menu. It lists your videos that matched Content IDs. At each one, you have a link labeled 'View Copyright Info'. In the other there is nothing like such message. So the video should be visible in every country.